How is it that door-to-door salespeople, marketers, car dealers, politicians, strangers, con artists, and cult leaders are able to persuade people to do things that they wouldn’t ordinarily do? That’s the question Robert B. Cialdini asked himself after falling victim to a huckster’s influence one time too many. But instead of shrugging his shoulders, this professor of psychology decided to study the phenomenon and find out if there is a set of common techniques used to convince people to hand over their money or time against their better judgment. 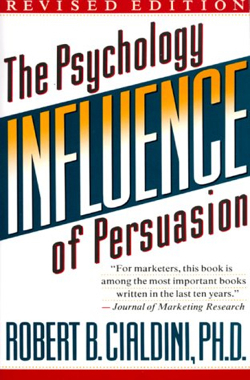 And he discovered that indeed there was, and wrote a book about it called Influence: The Psychology of Persuasion. With all the controversy about the building which will have Islamic prayers on Park Place in New York City (yes, that was very carefully worded), I thought it very pertinent that I pass along this this article from The Huffington Post by Matt Sledge. In it he discusses the use of the term “Ground Zero Mosque” and how it is being used to draw people into a certain way of thinking. An interesting read, to say the least. The LXD specifically creates a chasm between two groups of dancers rather than uniting them in the joy of dance. You can see this in the story line of “Antigravity Heros.” Two friends find some special warehouse that gives them the ability to dance like no one has danced before. When one friend is invited to the LXD and the other friend’s invite gets stolen, there is jealousy in the “other friend’s” face. The emergence of one of “The Uprising’s” main characters implies that this guy is going down the evil path and will most likely be facing off against his friend at some point. Now, the series is still going, so I can’t say that it’s foreshadowing because I haven’t seen the entire series, but having seen many a narrative played out, that is my educated guess as to how it’s going to go. Also, at the beginning of this clip, the two friends practice a form of capoeira, which was a form of dance that involved fighting/martial arts type of moves (and let me tell you from personal experience, it is not easy). Choosing a form of dance where these two friends appear to be fighting just tells me that they will be fighting/actually dancing competitively against each other in the future. So, the idea of dancing rather than fighting is not a new one and the acting in this series is not the best I’ve seen by far, but I find the intent to recreate this idea important. It’s as if we as a society want to express our aggression, struggle, and conflict, but without the permanence of actual death. I’m interested in seeing how this story will play out–will there be the continued trite binaries of good vs. evil, right vs. wrong, etc. or will there be unity in a shared enjoyment? Is this purely a simple dancing super hero comic book or an exploration of our own humanistic desires? Someone, please write something on the rhetoric of quitting a job. From the Jet Blue guy to this girl with the dry erase boards, there’s just so much material! The debate appears to hinge on motivation, with some health professionals advocating for the term “fat” with the argument that it will ostensibly shame them into improved weight management. The flipside, of course, is that the pejorative connotations could reinforce a negative self-image to the extent that is demotivates. 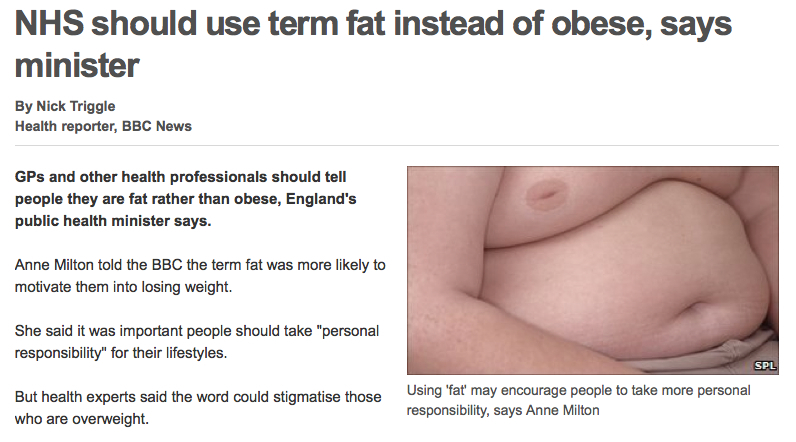 Professor Steve Field, of the Royal College of General Practitioners, makes an insightful remark about the rhetorical consequences of the term obese: “I think the term obese medicalises the state. It makes it a third person issue. I think we need to sometimes be more brutal and honest.” Field’s comment can be applied more broadly, I think, to the host of conditions that are now in the process of “medicalization,” with “disorder” being attached to a wide-range of conditions that not too long ago were tagged with more colloquial descriptors–and perhaps should remain as such. The DSM-IV is replete with new classifications like “personality disorder” and “caffeine intoxification disorder.” This trend toward medicalization is largely a rhetorical process and thus signals the need for understanding it along those lines, I would argue. Best Friends Animal Society, who runs Dog Town, often refers to these rescued and rehabilitated dogs as “homeless” on their website, which I find a tactful use of syntax. The term “shelter dog” carries an innately negative connotation, because, let’s face it, nobody wants to be in a shelter while “rescue” isn’t entirely appropriate either because the dog still exists in a state of fluxes and hasn’t been found that permanent home yet. The great thing about the word “homeless” in this situation is that it describes the animals’ state of being and reminds you that you could potentially fix that problem. Clever. Very clever.